(d) same number of chromosomes but twice the amount of DNA. (d) amount of DNA is reduced to half in each cell. (a) Cytokinesis: Cell plate formed, mitochondria distributed between two daughter cells. (b) Telophase: Endoplasmic reticulum and nucleolus not reformed yet. (c) Telophase: Nuclear envelope reforms,Golgi complex reforms. 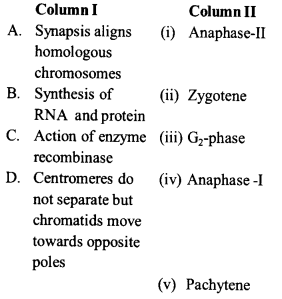 (d) Late anaphase: Chromosomes move away from equatorial plate, Golgi complex not present. (a) Metaphase: Spindle fibers attached to kinetochores, centromeres split and chromatids separate. (b) Metaphase: Chromosomes moved to spindle equator, chromosomes made up of two sister chromatids. (c) Anaphase: Centromeres split and chromatids separate and start moving away. (d) Late prophase: Chromosomes move to spindle equator. (d) Both prophase and metaphase of mitosis. (c) Golgi complex and endoplasmic reticulum are still visible at the end of prophase. (d) chromosomes move to the spindle equator and get aligned along equatorial plate in metaphase. (d) G2 phase follows mitotic phase. (d) formation of the contractile ring, and transcription from chromosomes. (d) the same genetic system is passed on from generation to generation. (d) one in mitosis and two in meiosis. (d) same number of chromosomes and half number of chromatids. (d) segregation and independent assortment. (d) disjunction of homologous chromosomes. Prophase-I of meiosis has been divided into five sub-stages which occur in the sequence as Leptotene → Zygotene → Pachytene → Diplotene→ Diakinesis. Synapsis i.e., pairing of homologous chromosomes occurs during zygotene. Crossing over i.e., exchange of chromatid segments occurs during pachytene. Terminalisation of chiasmata i.e., shifting of chiasmata towards the ends of chromosomes and complete disappearance of nucleolus take place during diakinesis. In diploid cells (somatic cells) during Gt phase, DNA content is 2C and chromosome number is 2n whereas in haploid cells (gamete) during G, phase, DNA content is 1C and chromosome number is n. S phase is marked by replication of DNA and the amount of DNA per cell is doubled i.e., it becomes 4C in somatic cells, whereas chromosome number remains same i.e., 2n. Thus, a somatic cell which has just completed S phase, will have 4C DNA content but 2n chromosome number, while the gamete cell has 1C DNA content and n chromosome number. A cell cycle is divided into G1 S, G2 and M phases. G1 or first growth phase is followed by S phase or synthesis phase. DNA replication occurs in S phase and DNA amount doubles up i.e., a cell with 2C DNA in G21phase will now have 4C DNA. G2phase is second growth phase where DNA content remains 4C. M phase is the phase of division where DNA content either regains 2C level (mitosis) or becomes halved i.e. 1C (in meiosis). G0 phase is the phase of differentiation where cell contains DNA as in the same amount as its parent cell and does not divide further. In ‘S’ phase of cell cycle the DNA content doubles, i.e., 1C to 2C for haploid cells and 2C to 4C for diploid cells. However, the number of chromosomes does not increase. Pachytene is characterized by the appearance of recombination nodules, the sites at which crossing over occurs between non-sister chromatids of the homologous chromosomes. Nodules contain multienzyme complex called recombinase. Recombinase is made of endonuclease, exonuclease, unwindase, R-protein, etc. During zygotene stage chromosomes start pairing together and this process of association is called synapsis. Such paired chromosomes are called homologous chromosomes. Electron micrographs of this stage indicate that chromosome synapsis is accompanied by the formation of complex structure called synaptonemal complex. The complex formed by a pair of synapsed homologous chromosomes is called a bivalent or a tetrad. During zygotene or zygonema of meiotic prophase I the chromosomes become shorter and thicker. The homologous chromosomes come to lie side-by-side in pairs. This pairing of homologous chromosomes is known as synapsis, or syndesis. A pair of homologous chromosomes lying together is called a bivalent. In metaphase, chromosomes consisting of two sister chromatids get arranged at equator. Discontinuous fibres radiate out from two spindle poles and get connected to the disc shaped structure at the surface of the centromere called kinetochores. These are known as chromosome fibres or tractile fibrils. A kinetochore is a complex protein structure that is analogous to a ring for the microtubule hook; it is the point where microtubules attach themselves to the chromosome. During gamete formation, the enzyme recombinase participates during pachytene stage of prophase – I. This stage is characterized by the appearance of recombination nodules, the sites at which crossing over occurs between non-sister chromatids of the homologous chromosomes. Crossing over is the exchange of genetic material between two homologous chromosomes. Crossing over is also an enzyme-mediated process and the enzyme involved is called recombinase. The given figure shows crossing over i.e., exchange of segments between two homologous chromosomes. Crossing over is characteristic of meiosis and occurs during pachytene stage of prophase -1. During anaphase I, from each tetrad two chromatids of a chromosome move as a unit (dyad) to one pole of a spindle, and the remaining two chromatids of its homologue migrate to the opposite pole. Thus, the homologous chromosomes of each pair, rather than the chromatids of a chromosome, are separated. As a result, half of the chromosomes, which appear in early prophase, go to each pole. Thus the paternal and maternal chromosomes of each homologous pair segregate during anaphase I independently of the other chromosomes. The plane of alignment of the chromosomes at metaphase is referred to as the metaphase plate. The key features of metaphase are, (1) Spindle fibres attach to kinetochores of chromosomes (2) Chromosomes are moved to spindle equator and get aligned along metaphase plate through spindle fibres to both poles. The key feature of metaphase is the attachment of spindle fibres to kinetochores of chromosomes. Kinetochores are disc-shaped structures at the surface of the centromeres. These structures serve as the sites of attachment of spindle fibres to the chromosomes that are moved into position. During early prophase of mitosis, nucleus and cell become spheroid. Viscocity and refractivity of cytoplasm increases. DNA molecules condense to form shortened chromosome. Endoplasmic reticulum and nucleolus starts disappearing. In cell cycle there are two main phases- interphase and mitotic phase. Interphase is divided into 3 stage G1, S and G2, G1 is first growth phase. S is synthetic phase and G2 is second growth phase. During S phase or synthetic phase the replication of DNA takes place. For replication of DNA histone proteins are required so they are also synthesized during this phase. It takes about 30%- 50% of the total cell cycle. Prophase and telophase are stages involved in mitosis or meiosis. During G2 phase division of centrioles, mitochondria and chloroplasts occurs. Interphase is the stage between two successive cell divisions. During interphase, chromosomes are decondensed and are distributed throughout the nucleus. It is the largest period in the cell cycle and is divided into three phase – G1, S and G2. During G1 phase the cell grows and synthesis mRNA, mRNA, ribosomes, enzymes and proteins necessary for DNA synthesis occurs. During S phase replication of DNA takes place. The nucleotides get assembled and DNA molecules are synthesized. During G2phase organelles like centrioles are doubled and mitochondria, chloroplasts etc. divide. Metaphase is the best time to count and study the number and morphology of chromosomes. The distinctly visible chromosome arrange themselves at the equatorial or metaphasic plate. The centromeres lie at the equational plate while the limbs are placed variously according to their size and spiral arrangement. At prophase the chromosomes appear thin and filamentous, forming a network. So they are not very clearly visible. At telophase the chromosomes uncoil and lengthen and therefore are not clearly seen. Anaphase also shows chromosomes distinctly and they can be counted. But during anaphase chromatids seperate and start moving towards opposite pole. So for counting metaphase is the best stage. M-phase or mitotic phase is the actual division phase and formation of contractile ring and formation of phragmoplast precedes reformation of nuclear envelope. Contractile ring is belt-like bundle of actin and myosin that appears during cell division immediately below the plasma membrane. Contraction of this ring leads to the separation of the two daughter cells. Phragmoplast is the region of plant cell cytoplasm that becomes evident in the latter stages of mitosis. It forms from the residual microtubules of the polar mitotic spindle and appears to function in transporting materials to the new cell plate forming between the daughter cells. Once the cell plate is complete, the phragmoplast is divided and gradually disappears, the cell plate finally becoming transformed into the middle lamella lying between the new cell walls. A spindle of fine fibres begins to develop during prophase. It consists of microtubules which are made of protein called tubulin and certain other associated proteins. These delicate fibres radiate from the centriole and constitute aster. This option was not given in the entrance paper. As actin and myosin are involved as contractile machinery in many nonmuscle cells so it can be considered as the correct answer. Myoglobin is present in muscles which can bind to oxygen. Mitosis occurs both in somatic cells as well as in germ cells of the gonads. In plants mitosis occurs in the meristematic cells of root tip or shoot tip. These cells divide at a faster rate. So the root tip shows active cell division and are used in the laboratory to study mitosis. For studying meiosis young anthers are used. Spindle is microtubular apparatus that appears in many eukaryotic cells at the beginning of nuclear division and is responsible for the ordered separation of the chromosomes, chromosomes being attached to the spindle fibres by their centromeres. Two types of spindle fibres can be distinguished as the interpolar fibre, which stretches continuously from pole to pole of the spindle; the kinetochore fibre, which stretches from the pole to the centromere (kinetochore) of an individual chromosome. The mechanism by which the chromosomes move and the spindle fibres contract remains unclear. Cells of animals and lower plants possess centrioles, which act as organizer regions for spindle microtubule formation, but centrioles are absent from the cells of higher plants. Interphase is the stage between two successive cell divisions. During interphase, chromosomes are decondensed and are distributed throughout the nucleus. It is the largest period in the cell cycle and is divided into three phase – G1, S and G2. During G1 phase the cell grows and synthesis mRNA, mRNA, ribosomes, enzymes and proteins necessary for DNA synthesis occurs. During S phase replication of DNA takes place. The nucleotides get assembled and DNA molecules are synthesized. During G2 phase organelles like centrioles are doubled and mitochondria, chloroplasts etc. divide. Microtubules are unbranched hollow submicroscopic tubules of protein tubulin which develop on specific nucleating regions and can undergo quick growth or dissolution at their ends by assembly or disassembly of monomers. Microtubules form spindle during cell division. Centrioles help in cell division by forming spindle poles or microtubules. In animal cells, microfilament collect in the middle region of the cell below the cell membrane. They induce the cell membrane to invaginate. In plant cells, cell plate is formed to separate the two daughter cells. Some of the spindle fibres called interzonal microtubules are deposited around phragmoplast. Vesicles from Golgi apparatus are deposited and coalesce on the phragmoplast to form a cell plate. Mitosis is an equational division where after division each cell produces two daughter cells, therefore after 7 divisions one cell will give 128 cells in case of mitosis. In apical meristems mitotic divisions occur at a rapid rate. In late telophase of mitosis, a nuclear membrane appears on the outside from either pieces of nuclear envelope or endoplasmic reticulum. The telophase may last as long as the prophase. Crossing-over is responsible for inducing variability. It involves an exchange of equal segments of non-sister chromatids belonging to two different but homologous chromosomes. Crossing over takes place at four stranded stage. Only two ofthe four chromatids take part in crossing over. The other two are called non crossovers. Zygotene is characterized by pairing of homologous chromosomes which is called synapsis. The first meiotic division which is completed at first telophase may be followed by cytokinesis giving rise to a dyad. Meiosis involves exchange of genes between homologous chromosomes. So the gametes produced are genetically different from each other. Offsprings produced by the fusion of gametes therefore also show recombinations or genetic variations. These variations in the offsprings make organisms more adaptable to the environment and these have a definite role in evolution. Meiosis II is shorter than the typical mitotic division because of the shortening of prophase of this division. The division maintains the number of chromosomes produce at the end of reduction division. Hence, it is called homotypic or equational division, though it is similar to mitosis. The main function of homotypic division or meiosis II is to separate the chromatids of univalent chromosomes which differ from each other in their linkage groups due to crossing over. Number of chromatids at metaphase is two each in mitosis and meiosis. Chromatid is a half chromosome during duplication in early prophase and metaphase of mitosis and between diplotene and the second metaphase of meiosis. After these stages chromatids are called a daughter chromosomes. Mitotic anaphase differs from metaphase in possessing same number of chromosomes and half number of chromatids. During anaphase of mitosis, chromosomes divide at the point of centromere or kinetochore and thus two sister chromatids are famed which are called as chromosomes. While during metaphase, chromosomes become maximally distinct due to further contraction and thus size of chromosomes is measured at mitotic metaphase. In meiosis, the daughter cells differ from parent cell as well as amongst themselves due to segregation, independent assortment and crossing over. Daughter cells inhibit variations. Meiosis leads to recombinations or new combinations of genes or characters as a result of crossing over. Due to these recombinations, variations are created, which have role in process of evolution. Segregation of Mendelian factor (Aa) occurs during Anaphase-I. The paired homologous chromosomes separate in meiosis-I so that each gamate receives one chromosomes of each homologous pair. During Anaphase-I chromosome divides at the point of centromere or kinetochore and thus two sister chromatids are formed, which are called as chromosomes. August Weismann in 1887 predicted that the number of chromosomes must be reduced by one half during gamete formation. The two divisions of meiosis are called the first and the second meiotic divisions. In meiosis I, the number of chromosomes are reduced from diploid to haploid condition, whereas in meiosis II, the two chromatids of each chromosomes separate from each other and go to separate daughter cells, as a result the number of chromosomes remains the same as produced by meiosis -1.